This is the page for my current project about art and politics in the year 1984. The project involves a series of dinners with people active politically and artistically in the year 1984 to explore and create multiple narratives of a time and place. These dinners are audio recorded, edited and the aim is to create a piece for radio, an installation and publication. The research began in the UK and in 2014 will involve 1984 dinners in Singapore, Australia and South Africa. The method of the dinner aims to create subjective interpretations of multiple, perhaps conflictual voices and memories through responses to archival material, personal testimonies and imagined scenarios. This project stems from the archival research I was doing during my PhD about the Greater London Council from 1981-86 and the relationship between the left-wing metropolitan council and their support of activist, feminist, anti-racist, overtly political art groups and actions at the time. This was happening at the time of, and in direct opposition to, the Thatcher government. During the 1980s there were contradictory policies and approaches to arts funding being carried out simultaneously. I am interested in how artists and activists were intervening into and/or developing alternatives to Conservative politics at this time. How were feminism, anti-racism, social justice and cultural democracy, for example, informing debates and practices? What were the pressures, obstacles and opportunities for artists and activists? The increasing conservatism of an official, national cultural policy in the 1980s appear to be at odds with the Labour-controlled Greater London Council and other regional local authorities, which were able, it seemed, over five years (1981-86) to support relatively radical, anti-racist, socialist, politicised art practices and campaigns before the eventual abolition of Metropolitan Councils by the Conservative Government in 1986. Significant to my particular research interest into art and politics, 1984 also saw the publication of the English translation of Michel de Certeau’s The Practice of Everyday Life (originally published in French 1980) by Steven Rendall and Owen Kelly’s Community Art and the State: Storming the Citadels by Comedia. While these are two very different publications, they have proved important reference points for me during my research into the histories and theories of socially engaged art. 1984 was also the year ‘cyberspace’ was introduced to the English language, British Telecom was privatised, Tommy Cooper died live on TV, coal miners were on strike, the Apple Macintosh computer first came onto the market, the IRA Brighton hotel bomb exploded and Band Aid released ‘Do they know it’s Christmas’ to raise money for the famine in Ethiopia. It was also the year ‘Into the Open’, one of the first major exhibitions by a municipal gallery of contemporary work by black artists opened in Sheffield and the Arts Council published ‘The Glory of the Garden’ report on the inequitable distribution of funds for the arts beyond London. Through a brief exercise in time travel I wanted to explore the tactics and practices of artists/activists working in the margins of institutionalised culture during the Torie government of the 1980s, and consider what we can learn from these approaches in a different era of Conservative-Liberal Democrat politics, 27 years on. On 29 September 2011, I hosted a dinner with six invited guests in my studio building on Deptford High Street, London to discuss art and politics in the year 1984. My guests were Loraine Leeson, Sonia Boyce, Stephen Lobb, Flick Allen, Leila Galloway, Shirley Cameron and Roland Miller, all artists actively working in the UK now and in 1984. 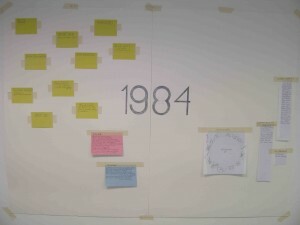 The resulting online audio essay documents the first stage of my investigation into art and politics in the year 1984. The essay and audio extracts cover different topics prompted by a menu of questions I prepared for the guests and which were used to frame the discussion. 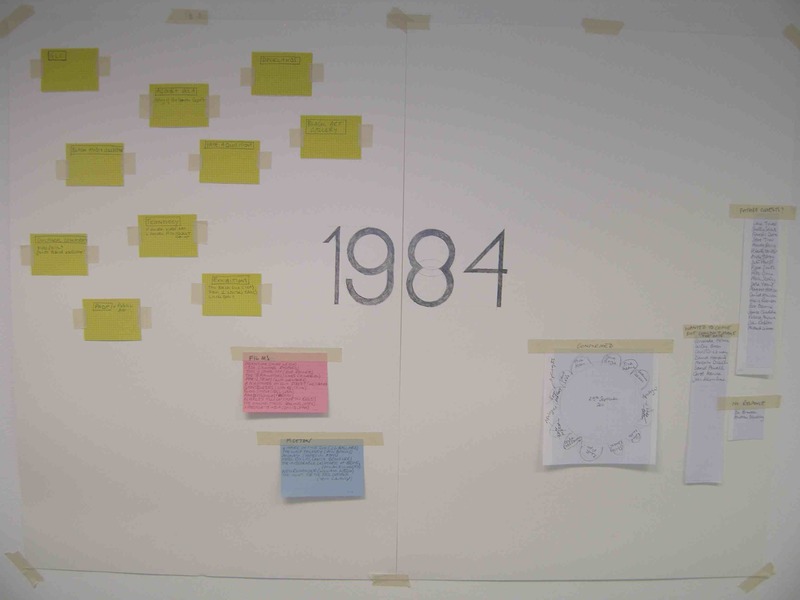 These included questions about the frictions and conflicts that existed at the time among artists, the institutional support structures and funding they tapped into, how they made a living and what they think of the context now in relation to 1984. Unsurprisingly the conversation was fluid and moved beyond my menu of suggested topics. It could have continued for hours longer. Towards the end of the meal, for example, the guests realised they had not yet discussed the hugely influential topic of technology or the important shifts in disability arts at the time through activist self-help groups, pointing out that a lot of this work was happening at the Albany Theatre, just round the corner from where we were sat. I am interested in how this audio archive might trigger discussion and further responses about the political and economic context of art and activist practices in the mid 1980s in relation to past, current and future theories and practices or art and politics. How can one translate and re-interpret events one did or did not experience first hand? Flick Allen mentioned during the first dinner how this exercise acted as ‘reiterative inspiration’ in terms of reflecting where we are now in relation to our previous histories. I held this dinner because I wanted to find out more about what was happening in 1984, but also experiment with the act of remembering collectively and the issues of translation and reiteration. What was interesting about the method of the dinner format was that the guests at the table shaped the conversation. Narratives of 1984 were formed from the memories and viewpoints present. Each recall and reflection triggered further reminiscences and ruminations. The type of ‘data’ that emerged was very different than if I had interviewed people individually. I would have been unable to offer any first hand experiences and the interviewees would have been conversing with themselves, with me as eager listener. Rather, the generative effect of the dinner conversation prompted a richer flow of reference points and experiences. I am interested in the fallibility of fieldwork and the connections between research methods (the practice) and the content of the research. I want to explore ways of entering the material and history in a way that does not ignore the complexity of experiences, agendas and ideologies of a time and place, but to navigate my own journey through these different territories of memory. In order to further develop this project in 2014, I am planning to co-produce audio/archival snapshots of life in 1984 in different contexts across the globe, taking a deeper look at particular struggles, methods of working and survival, support structures and contentions in Singapore, Australia and South Africa. As well as co-create a body of material with people in the different locations that could be shared and built on between us (via a website and publication), I am interested in experimenting with the method of the dinner as a site for creating collective (perhaps contradictory) memories and the layers of narrative produced through reminiscence and storytelling that emerge from that. The project is about the historical content – what was happening in terms of art and politics in the year 1984, but also about the methods of how territories of memories and narrative fictions of recent histories are created and re-interpreted across generations and geographies.